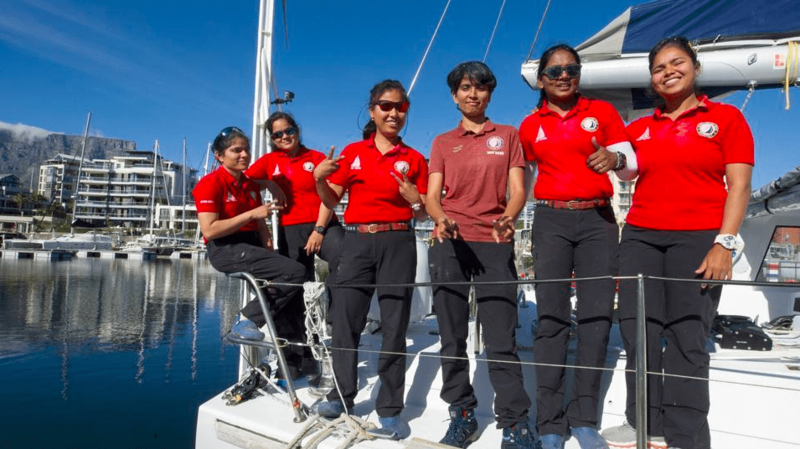 INSV Tarini, With The Navy`s All-Women Crew, Arrives In Goa After Circumnavigating The Globe: The all-women crew of the Indian Navy on board the naval vessel INSV Tarini has reached within port limits of Goa. The INSV Tarini, with first ever Indian female crew out to navigate the world which was part of a traditional circumnavigation exercise. Defence Minister Nirmala Sitharaman will meet the crew when it arrives near Panaji, from where it had embarked on the journey on September 10 last year. “The Defence Minister and Navy Chief Admiral Sunil Lanba will be present for the flag-in ceremony of the ship near Panaji on Monday,” a Navy spokesperson said to NDTV. “The crew is set to arrive in Delhi on May 23 and shall felicitating by PM Modi,” said the Indian Navy Spokesperson Capt D K Sharma while speaking to indianexpress.com. Prime Minister met a crew of Navika Sagar Parikrama last year. Prime Minister meets the team of Navika Sagar Parikrama previous year. Navika Sagar Parikrama is the name of the expedition for circumnavigating the globe on INSV Tarini. The all-woman team led by Lieutenant Commander Vartika Joshi circumnavigated and managed the whole operation. The crew also included Lt-Commanders Pratibha Jamwal and Swati P, and Lieutenants Aishwarya Boddapati, S Vijaya Devi and Payal Gupta. Captain Dilip Donde, the first Indian to solo-circumnavigate the globe in the year 2009 to 2010 and Captain Atool Sinha, an Asian Games silver medallist, took almost three years to prepare for the six-member team for the exercise. Lieutenants Aishwarya Boddapati, S Vijaya Devi and Payal Gupta. The expedition was sailing in six legs, with stopovers at the Fremantle (Australia), Lyttleton (New Zealand), Port Stanley (Falkland Islands), Cape Town (South Africa) and Mauritius. Covering over 21,600 nautical miles since she left Goa, INSV Tarini visited five countries and crossed the Equator twice, sailed across four continents and three oceans, and “passed south” of the three “Great Capes” – Leeuwin, Horn and Good Hope, the Times of India reports. Specialized training was given to the crew for two years to help it learn the ropes of astronomy, meteorology, navigation, communication, seamanship and reading weather and weather maps. During sail, one is on the rope, 60 ft from the boat, managing the mainsail, and the other is looking after the riggings, and the third is on the wheel, what would they do if the one on the rope falls? They have no choice. We cannot go at sea and get one of the people back because they had an accident, said the Indian Express quoted Capt Sharma as saying. The naval team battled winds up to 60 knots in the middle of the Pacific Ocean. It was a grueling test of human endurance, perseverance and sailing skills to battle the elements of sea and its wrath, said Navy Spokesperson Captain D K Sharma to the Times of India. In an interview with the Indian Express, Lt Cdr Vartika Joshi reflected on one of the significant challenges before they crossed Cape Horn, often referred to as Everest for the seafarer. The waves kept coming one after the other. It was terrible, and we had not seen something like this before, said Joshi. The crew was preparing for the impending storm. We cut down our sail. We had to hand-steer the boat for 16 to 17 hours at a stretch, and we cut down all our power sources and automatic steering. We divided ourselves to keep a watch, three on deck and three taking rest. During the night, it would get disorienting as there was no clear sky. We used to listen to the sounds of the wave and then keep the boat steady, Joshi adds. There was water even inside the boat. The skipper came floating; she was trying to make out if she was on board or in water. Lt Vijaya and I decided to find our way to the wheel and controlled the boat, adds Lt Jamwal. The crew managed their daily activities, and during the halts, they prepared for the remaining journey and also stocked up the food supply. So, these are the points to describe on the INSV Tarini, with the Navy`s all-women crew, arrives in Goa after circumnavigating the globe.